What are you up to later? Wanna knock over some banks and buy this gorgeous red left-hand drive 1967 Toyota 2000GT off Bring a Trailer with me? Sure you do. We’ll put in some work and be in this beauty in no time. Up for grabs on everybody’s favorite air-cooled Porsche marketplace is this fantastic example of Toyota’s rare ’60s flagship car, in brand-new condition with just 14 miles on the odometer, which had been reset at some point. And it’s one of just 62 left-hand drive, U.S.-spec 2000GTs ever made. So basically, it’s more than worth the cost of us recruiting a crew, getting some equipment, buying a set of Ronald Reagan masks and some spray paint to cover up the security cameras, then going on a bank robbery spree until we all have enough cash to call this thing ours. This example (chassis MF10-10100) was purchased new by the late Otto Linton, a Philadelphia-area collector, tuner, racer, and Toyota dealer. It remained with Mr. Linton for over 30 years and has since traded hands between a number of private collectors. Marque specialists Main Line Exotics performed a partial restoration in 2006, and the car was showcased the following year at the at the Monterey Historics as part of the Toyota Motorsports 50th Anniversary display. It also participated in the 2010 Copperstate 1000 and received approximately $29k in mechanical service under the previous owner. MF10-10100 is now being offered by the selling dealer in San Jose, California with its original owner’s manual, factory tools, and clear Montana title. As many of you know, the Toyota 2000GT is a vitally important car in Japanese automotive history, just as much as it is pleasing to look at. In the vein of great 1960s grand touring cars like the Jaguar E-Type, this limited-production machine showed the world what Toyota—still then a relative newcomer on the global automaking stage—was capable of. It was advanced in its day and remains extremely rare to this one. This listing even comes with the damn instruction manual! Oh, what a feeling—a feeling that makes me want to rob some banks to own it. And seeing as how the bidding is currently at $400,000 with a week to go, we will almost certainly have to. Plus, that interior’s extremely choice. Look at all that wood and leather and chrome. It’ll be a great place to spend time, especially in the event of a police chase. Which very well might happen, what with all the bank robbing we have in store. Don’t feel bad. Nobody’s gonna get hurt—long as no one tries to be a hero, of course. Plus, these banks are FDIC insured. I’ll tell you who the real crooks are: all those Wall Street fat cats! In that way, we deserve this 2000GT. We’re getting what’s owed to us. I suppose if you want to acquire this wonderful example of a 2000GT through more legitimate means, you can put in your bid here on Bring a Trailer. Everyone else: email me your résumé with photos of the best safe you’ve ever cracked. Clarification: This story has been updated to add that the 2000GT’s odometer was reset, and now has 14 miles. 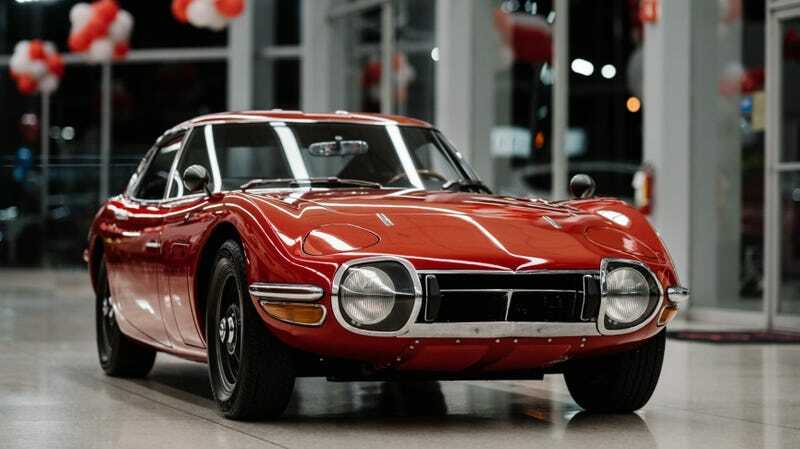 Why Buy A Million-Dollar Hypercar When You Can Buy This Pristine 1967 Toyota 2000GT Instead?